2 I found this little bird dead in the snow in the garden. Cant find anything similar in my reference books - perhaps its an adolescent. 2 On further research....might it be a Stonechat? 44 Yes, this looks like a male Stonechat, PBears. 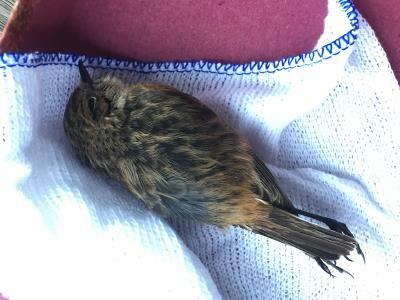 In the bottom photo there is no stripe showing above the eye and the colouring is that of a stonechat with the rust-red breast. In the top photo however there seems to be a stripe over the eye, which suggests a Whinchat. They are similar size & colouring. The front on a Whinchat is a softer apricot colour and the white colour continues up the chin to the beak. 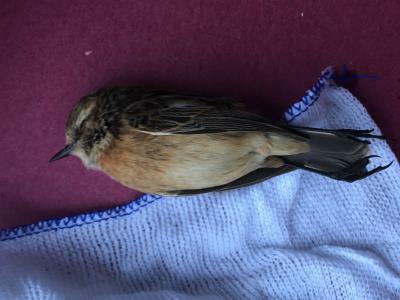 However, as this bird was found recently it is far too early for a Whinchat to arrive, so I am sure you are right with Stonechat.